The 4th edition of the globally bestselling Chirurgie de la Main is made available to the English-speaking population for the first time in Emergency Surgery of the Hand. The text synthesizes the most current knowledge in hand surgery, emergency, and surgical principles for today's surgeons and fellows. 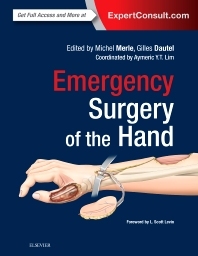 Edited by internationally recognized experts Michel Merle and Gilles Dautel, Emergency Surgery of the Hand includes an abundance of illustrations, photographs, and step-by-step descriptions to ensure the best possible outcomes for each unique patient scenario. Provides coverage of today's hot topics in hand surgery, including free tissue transfer and pedicle flaps, as well as emergency care of infections. Prioritizes surgical techniques that allow rapid return to work. Covers the latest information on surgical principles, relevant anatomy and physiology, surgical techniques, outcomes and rehabilitation. Step-by-step descriptions of surgical procedures are enhanced by crisp, clear surgical photographs and illustrations. est professeur des universités, praticien hospitalier et chef du service de chirurgie plastique et reconstructrice de l'appareil locomoteur au CHRU de Nancy.